Pest controllers have been called in to one of the UK’s biggest eco-communities to tackle an infestation of giant rats that tenants say has left them scared to take their rubbish out. 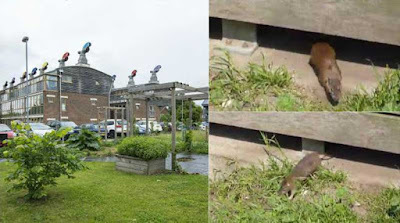 Residents of the BedZed estate in Hackbridge, Surrey, the country’s first zero-carbon housing development, have seen 10-inch rodents scurrying from under bins and along the bank of a nearby stream. The furry critters are believed to be nesting near to the 82 homes, according to housing association Peabody Estates, which runs the site. Elodie Ledent, 34, who lives on the estate, said: “I’m scared to take my bin out now, they jump out at you as you open the bins to throw the rubbish away. I have even taken my rubbish out to the bin in the street because the rats are not afraid to come close to you. I first told Peabody about this problem with the rats in October and they have not done much since.” She added: “I do think some of the blame has to be put on some people just leaving their rubbish out, it’s a shame because they don’t think about others who live here.” BedZed tenant Marianne Rasmussen, 53, added: “It’s been a problem for some time now and they come near the homes. “When people are coming home at night you can hear them as they see rats run across the path. In some ways the unintended consequences of having the soakaways is that it makes a lovely home for them. But it is also Peabody’s failure to manage the problem and take action. There seems to be no incentive for them to do so.” Peabody Estates said it was investigating the problem, which has also been reported to Sutton Council. A spokesman added: “We’ve visited the site regularly with our pest control experts, and believe there could be nest sites near the river. Hackbridge, Surrey, reporter John Watson admitted that he had investigated the matter months before, but had refused to write a column about it for fear that this was "a story for which the world is not yet prepared." I don't know what an inch rat looks like, but there are only 10 of them so I am not sure what the fuss is about. The truth is that we are all inhabitants of this planet, and while the humans build their houses and cities wherever they want, them not giving thought to what homes they may be building over, i.e rats, hedgehogs, rabbits etcetera, they surely have to expect that those same animals will still need to live somewhere and eat something. I had rats so called 'invade' my property a while ago, it was winter and they came to share the food I put out for my pet rabbits. The rats were quite large, about 220 to 250 mm long in their body, with tails the same length again, quite beautiful creatures. Anyhow, the issue was solved by me putting food out for the rats themselves, and, after a few months of the rats coming to the shelf I had built to put their food on, I was able to hand feed a few of them, although they really just took the food out of my hand and ran back to 'safety'. Perhaps we need to change our thinking, this world has many different animals on it, how about we don't just try to kill them all off and keep the earth for just ourselves ?